This is my first year working with Passports With Purpose, which is an annual travel bloggers’ fundraiser. They started in 2008 and now over 200 travel bloggers from around the world team up to offer travel-related prizes. Each $10 donation gives you a chance to win one of these great prizes being offered. I think one of the best things about this fundraiser is the fact that 100% of the proceeds (excepting PayPal fees) goes to Worldreader. 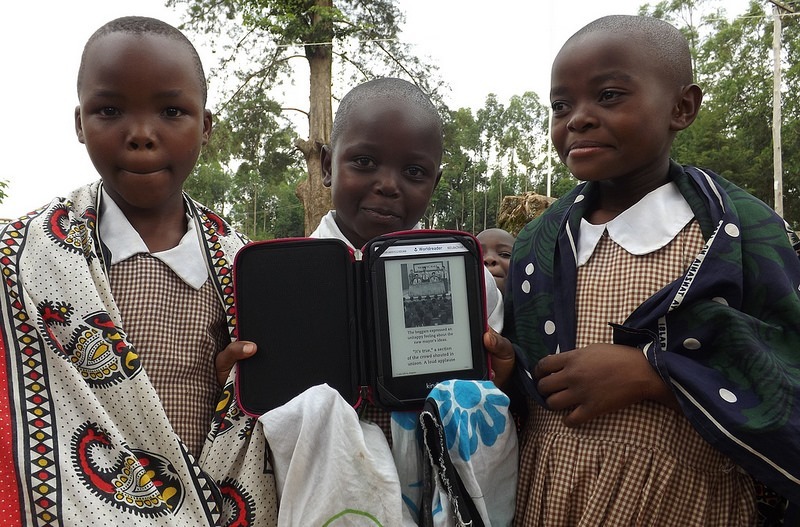 The e-readers will provide about 6,250 children, teachers, and parents with access to more than 50,000 books! More information about the project can be found here. The books will contain both English and Swahili fiction and non-fiction for all ages, as well as Kenyan textbooks. If you read my blog, you know that I am a huge fan of Go-Go Babyz, and especially their TravelMate products. I have been using their products for over seven years, and for hundreds of flights, and I recommend the TravelMate products to everyone who flies even just once a year with their child. The TravelMate Deluxe turns your car seat into a stroller. 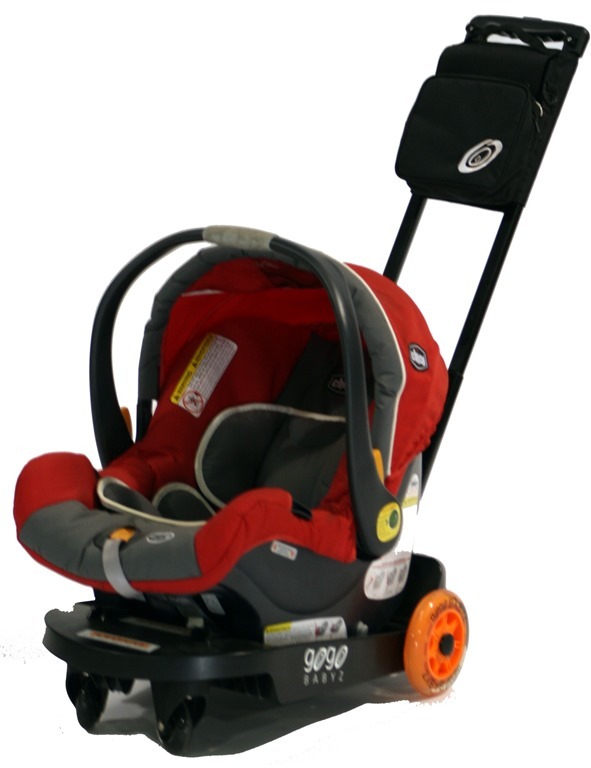 You simply snap or strap your own car seat onto the TravelMate, and you have an instant stroller, with telescoping handle, hands free foot brake, and swivel front wheels for easy steering. And I mean easy steering! You can easily steer with just one hand, which is so helpful when you’re going through the airport! You have that second hand free to make a phone call, carry another bag, or (most important to me, ha-ha) carry your coffee. It is undeniable that flying with your baby or toddler in a car seat is the safest way to travel, and of course you will need a car seat at your destination. The Go-Go Babyz TravelMate Deluxe is my favorite solution for transporting a car seat through the airport and does double duty as a stroller for your child as you travel. This is ideal, too, if you’re exploring a city and need to take a cab ride. You have the car seat with you for the safety of your child, and the TravelMate Deluxe quickly and easily folds up. We have used the TravelMate Original and the TravelMate Deluxe Cruizer, as well as the Handle Pouch, which is included with the TravelMate Deluxe in this prize package. My reviews of the Cruizer and Handle Pouch are found here and here. The handle pouch is very useful. It’s perfectly shaped so that you can find everything in it without things getting jumbled at the bottom of the bag. In my review of the handle pouch, I show what items I pack inside. You will be amazed at how much the Handle Bag can store and keep organized! 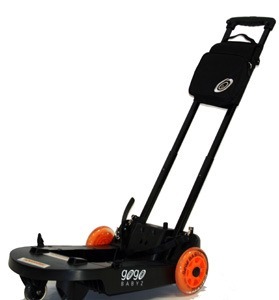 The TravelMate Deluxe Cruizer that I reviewed is similar to the Deluxe offered here, but this one has smaller wheels than the one I tested. This is nice, as it makes it more compact for storage and stowing in overhead bins or car trunks. I love that this bundle also includes a storage bag. I need to order one of those for myself! Donate And Earn a Chance to Win! During this two week period, Sunday, November 8, 2015 11:59pm EST to Wednesday, November 18, 2015 11:59pm EST, you will be able to donate $10 on the catalog of prizes. For every $10 donated, you earn another chance at winning your selected item, and all proceeds go to Worldreader. To make your donation and earn a chance at winning a TravelMate Deluxe Bundle, click here. To view the complete prize catalog and make your donation, click here. 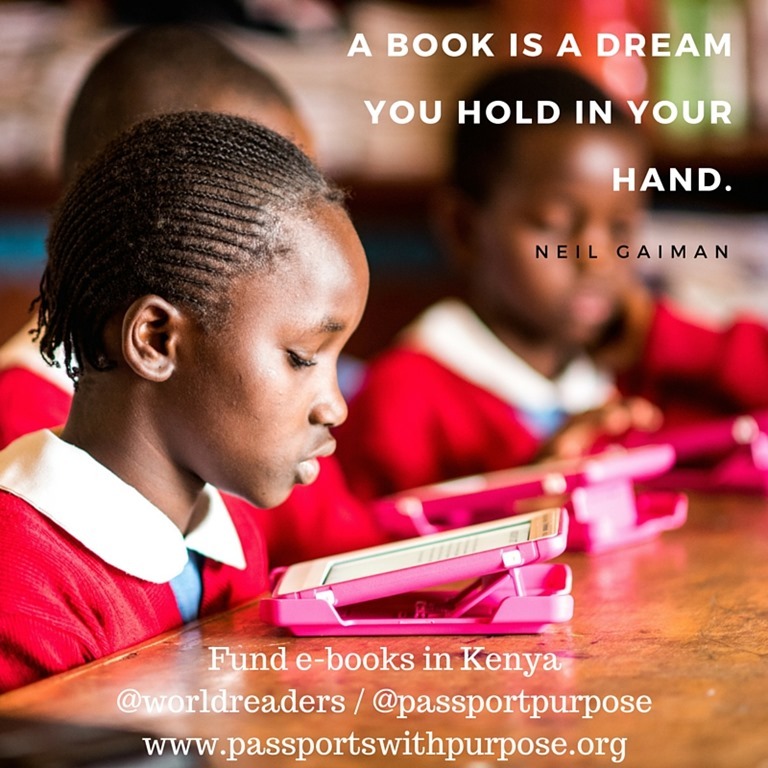 Will you join me in this effort to help bring e-readers and books to children, parents, and teachers in Kenya? Donate $10 and get an entry to win the Go-Go Babyz TravelMate Deluxe Bundle. Maybe your kids are out of car seats and you don’t need this item. Check out all the other fabulous travel related prizes that bloggers have contributed for this project. There are lots of great items! You can find the complete catalogue of items here. Remember, each $10 donation gets you another entry towards winning that item! You can find the complete catalog here. Thank you for reading this post, and for considering a donation to help bring the gift of reading to others. I would love it if you would share this post with your friends and encourage them to participate as well! A huge thank you to Go-Go Babyz, who generously donated the prizes of (2) TravelMate Deluxe Bundles. Give them some love by following on Facebook and Twitter. And thanks to TBEX Travel Blogger Conferences, who also sponsor Passports with Purpose.